So much changes with kids, and it changes fast. Little things they said or did are gone in a few weeks... phases come and go without warning. 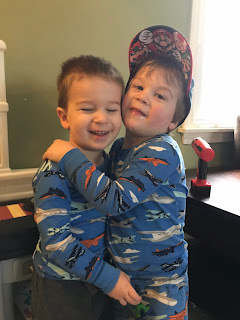 I don't know why it's hard for me to get on here to update (ya know, other than the fact that I have four kids and a home to take care of) but I long to sit and write each and every little thing my kids are doing. It's my only sort of pause button in this life of a mom. But life gets in the way, and save for some videos and pictures, little moments are gone in the blink of an eye. Anyway, enough being sappy. My daughter. She's the reason I wanted to take a minute to write. 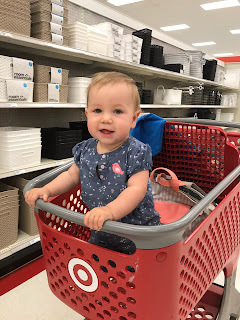 I titled this post new territory because for this girl of mine often makes me feel like a first time mom with no answers. You know what she's not doing? Sleeping through the night. 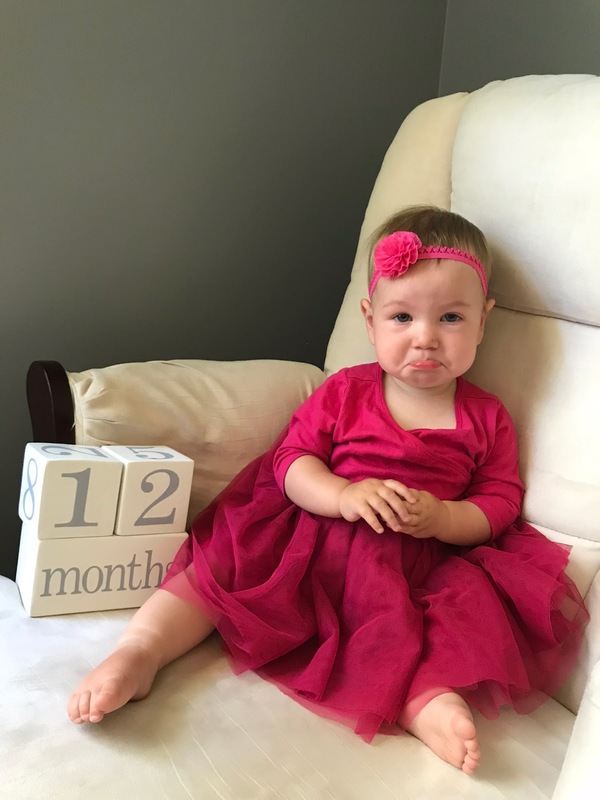 My boys were all successfully sleep trained well before their first birthday... we tried it, multiple times, it just doesn't work with her. I'm at a loss. Sometimes I spend hours in her room passed out on her floor by her crib, holding her hand in some awkward angle leaving my arm asleep from the shoulder down. It's comfy. (insert eyeroll) So yeah, that's been fun. Now that Easton is in kindergarten my alarm is ringing at 5:50am so I'm adjusting to around 6 hours asleep. I probably could get more if I went to bed at a decent time, but I'm binge watching Jane the Virgin and I just. can't. stop. Don't feel sorry for me! I will always look back at these nights of sleeping on her floor with fondness. I mean, how cute is it that she needs to hold mommy's hand?? I'll survive. There's coffee. Ok so the second thing on the list of "new" to me is the fact that I, as of today, have nursed her for 14 months. She hates bottles, cows milk, sippy cups of cows milk, cows milk out of a straw (unless it's chocolate, lol) and honestly, she eats like a bird. So, she still nurses. Like a lot. Mostly it's just quick little 3-4 minute sessions. But there is no end in sight. This girl has been a momma's girl since day one and she ain't letting go easy. I always kind of rolled my eyes at extended breastfeeding, but, at this point, I'm too lazy and out of good reasons to wean. Whatevs, she likes it... it's free and good for her. I think 18 months will be a maximum, hopefully before then. I guess we'll see how it goes, but like I said, this is new territory! 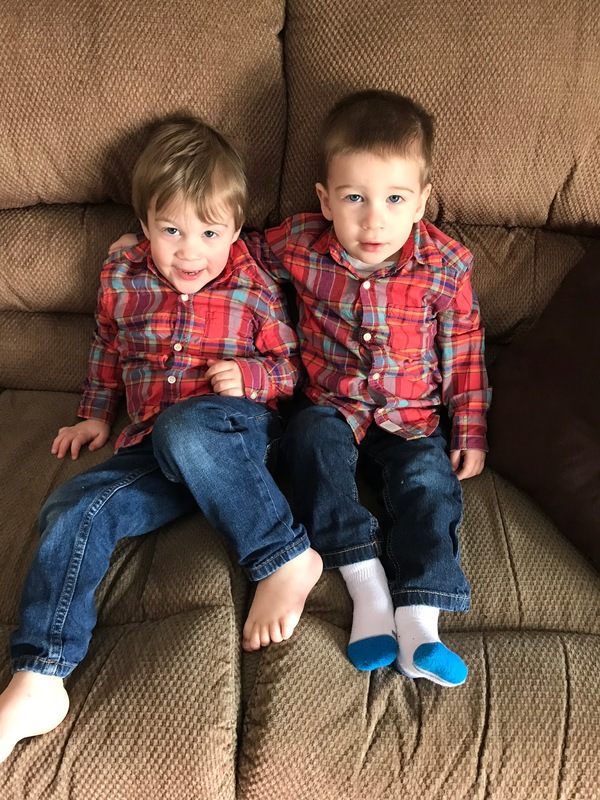 Easton nursed until 12 months, the twins made it to 14 months too, but that last month was only morning and night. But time goes so fast. What's a few more months of sleeping on the floor and nursing? She'll get the hang of it. I will long for these days when she's a teenager slamming doors in my face and telling me she doesn't need me. 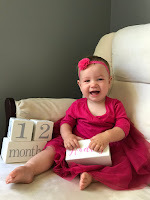 Yesterday, my sweet baby girl turned one! I have no clue how that happened so fast and I'm not happy about it. I feel like last week she was this chubby, happy, little 4 month old who just smiled all day long. Now she's crawling around with her brothers, playing with toys, being loud and sassy and adorable. This first year was absolutely wonderful, even though it was fast. My little girl has been my sidekick, my little bestie all year long. Whether I liked it or not, she went with me wherever I went (thanks to clingy-ness and refusal of bottles). Grocery stores, Bible study, Target runs, even date nights. I'm not even mad. Everywhere we went we would get stopped by random strangers commenting on her beauty! I mean, they are right, right? We spend a lot of time together, for sure. She still doesn't sleep through the night, despite all my efforts and multiple attempts at sleep training. She just wants me close. We co-slept for the first six months so I understand. And to be honest, she's my fourth kid so it doesn't really faze me to get up three or four times a night. I've been doing it for five years it seems. Part of her attachment to me is nursing. I don't think we're going to be weaning any time soon. She still nurses probably 6-8 times in a 24 hour period. Usually not for long, but she demands it often. (She thinks she's in control... she kind of is...) She's eating food but never too much at a time. That girl LOVES bananas and most fruit. Blueberries, watermelon, cantaloupe are among the top favs. She loves to play with her brothers and she thinks she can keep up with them. If they go running down the hall to their bedroom, she's usually not far behind crawling as fast as she can. She can take steps, but it's not her preferred method of getting around yet. She's a bit wobbly still, but I'm ok with that. My girl is such a sweetheart. She can be a little dramatic and sticks her little bottom lip out so far when we say no. She will hug or kiss you if you say "awwww." She loves to play outside, especially in the sand. If she finds a dinosaur laying on the ground she will go "rawrrrr" in the cutest way. She likes to say "go!" and was saying quite a few words last month but this month she doesn't feel like it apparently. For a while she was saying "love you" and it melted us all. She does what she wants, though, she is the princess after all. We call her that, but her most popular nickname is still Nugget or Nugs. She answers to it and her brothers even call her that sometimes. I wish I could sit here and write down every detail of each stage my kids are in right now. They change so fast. The cute thing they did last month is gone now, and the things they are doing today may be gone soon. Right now, Easton is obsessed with Sonic. He's registered for Kindergarten and has started to learn to swim without swimmies. Every time we get in the car he requests the song "Reckless Love." Maverick tells me "love you too" even when I don't say it first. He is still full of trouble but is much better behaved and loves to be silly. Tucker calls Hadley "Haley Laine," and has a bowl of cinnamon toast crunch every morning. He's goofy and always surprises us with how much he gets when we think he's not paying attention. All three of them like to put on capes and masks and shoot the bad guys with nerf guns. They will play outside for hours and be absolutely filthy and happy. 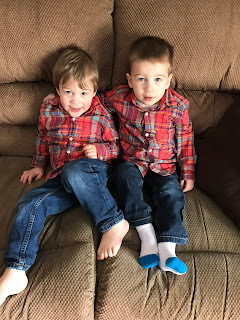 They are sweet boys and take such good care of their baby sister. It's always chaotic, but I go to sleep every night feeling so grateful and joyful that they are my kiddos. God has been so kind to us. With three boys and northeast winters, we are so ready for spring by the time March comes. To say that we have cabin fever is an understatement. Here it is mid-march and its still snowing, adding to what's already on the ground. I mean, we get excited about 40 degree days, it's that bad. I went to school near Philadelphia and their spring seemed to come on time. By the end of March, there were signs of life everywhere! Here, it's not until May that we even get to see leaves on the trees. That's the price we pay for not having to deal with hurricanes, or poisonous snakes/spiders, or tornadoes. I guess we'll survive. Even though we do have cabin fever, the company couldn't be better. And if you take three seconds to top and start listing the things we're grateful for, the complaining over the weather ceases almost instantly. It's pathetic, really. What do I lack? Sure, sunshine may seem brighter and more joyful, but I have four little sunshines in my house right now, full of life and brightness! And we're cozied up in our small but warm and comfy home, and my morning coffee is still (mostly) warm. I even have a bunch of songbirds hanging at my feeder lately, including a bright cardinal couple that makes makes me go awwwww. Long story short, I'm not going to complain!! Life is wonderful. God has heaped his blessings on me and I've got too many to worry about what the weather is doing. We have a mini-vacation coming up this weekend, though! Two days at an indoor water park will definitely be a pick-me-up! I think I'm more excited than the kiddos. We went last year just for one night and had an absolute blast. The boys are older and will be more independent this year so it should be awesome! Hopefully Hadley will cooperate a little bit. I'm thinking maybe the sound of rushing water will help her pass out when it's nap time. We'll make it work either way. Both sets of grandparents are coming with us and a few Aunts/Uncles so we'll have lots of help! Other than that, our schedule is pretty light for the next few weeks/months. I like to spend these last few weeks of spring making plans for warmer weather. I'm excited to get in my gardens and clean up the yard. I had to start my gardens from scratch when we bought the house (5 years ago) and I had no clue what I was doing (still don't!) so I like to add a few new perennials every year. I've had bad luck with bulbs from Walmart so last year I got a few more mature plants from home depot. I think I'll go someplace local this year and get a few new perennials and a bunch of annuals. I don't ever fertilize them and still somehow my annuals end up really taking off. Wow, birds, gardens... when did I get so old? This fall I turn 30 so I guess it's okay to have more mature hobbies. I'm not sure that I care, though!! Flowers make me happy. Joanna Gaines likes plants so it must be cool. (She is the standard of cool). And if I don't dream of spring than I start to go crazy with all this gray. So today, I'm going to plan for our little get-a-way, maybe look at a plant catalog, and fire up the grill in the snow for dinner. Spring is coming! It's March already, how did that happen? I'm not complaining here. These long, gray winters are slowly killing any mojo I have to do anything. We had a few nice days this week and it got me very excited about the spring! She's my little bestie and I absolutely adore her. She's a total momma's girl (like I usually can't get away for an hour to grocery shop because she has meltdowns). She has the sweetest personality and laughs so easily. She ADORES her brothers and they make her laugh harder than anyone else. She loves toys and is so content on the living room floor watching her brothers play. 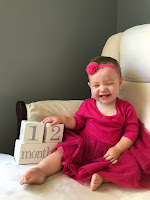 We coslept for the first 6.5 months but as she was becoming mobile we new that had to change. We transferred her to a crib a few weeks ago and it's going ok, not great. I think she was up like 4 times last night... (insert eyeroll emoji). Buutttt it's a big change, so I'm trying to be patient. Well, I could gush about her for forever but I do have three other kids. Easton is 4.5 now and I'm dreading the fall when I have to send him to kindergarten. He's so smart and sweet. He can write his name now and he loves practicing letters and doing "school work." I hope he loves school. He's still my biggest helper. 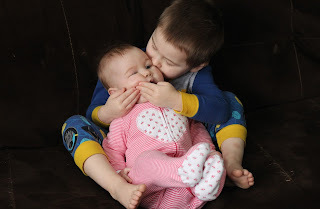 He lets me know when his brothers are being naughty and he goes and comforts his sister if she starts fussing. The bond between him and her is sooooo cute. They love each other so much. My heart bursts watching those two! Then there are the twins. I love these two boys so much. But they are two. And there is two of them. So they definitely make my life a bit more difficult. And exciting. And hilarious. They both are such opposites. Mav is loud and always fired up. He talks like a grown up and picks up on everything. He's the first one up in the morning and takes no time to wake up. Tucker is quiet, gentle, and a bit dramatic. He's also strong as a horse and climbs everything he can (and has since he could walk). Lately he's been coming up to me all dramatically and saying "hug" with arms open wide. He loves music and says firetruck the funny way 😉. They are a blast even if they are tiring. They are still doing great on the potty, but lately they have to go at the same time, one on the big potty and one on the little one. Then they both "wash" their hands which results in my entire bathroom soaked (and whatever isn't soaked in water is probably wet from pee...) Boys are fun. Ish. There's not much going on in our family right now. We did our taxes, that's pretty exciting (four dependents, woohoo). We booked two nights at an indoor splash park and that's coming up soon. Jer is working tons of overtime. We're working on paying off debt in hopes of adding on to our cozy-but-tiny house in a few years. I've been trying to keep up with the kids and lose this baby weight. I started a 90 day challenge January 1st and as of yesterday I'm down 16 pounds and almost 10 inches. It feels great, but I still have some work to do. I'm ready to do some outside exercise. And by that I don't mean shoveling snow, which I had to do today since we got like 10 inches dumped on us last night. I'm gonna go ahead and count that as cardio for the day. Anyway, life is good. It's chaos, but so good.